Hubby likes cookies. Every time we stop by the coffee shop, he picks up one or two. Last time I made some cookies from chef Elizabeth Falkner's book Demolition Desserts. He liked the cookies so much that he did not even believe that I made from scratch. So this time I made them again, only this time I did not use egg. Cookies taste crisper with eggs. In a large bowl, using a fork , cream together the butter, granulated sugars and molasses until smooth but not over mixed (picture No. 2). Add vanilla, and salt and stir just until combined. Sift in the flour, baking soda, and stir gently just until combined (picture No. 4). 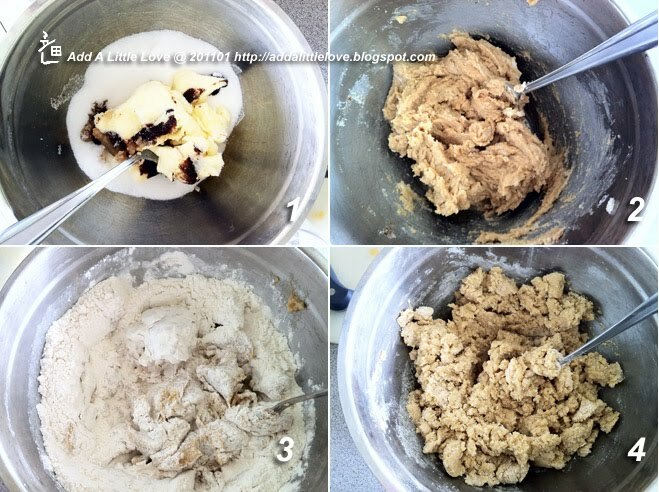 Add the chocolate and stir just until evenly distributed throughout the dough (picture No. 6). Cover and refrigerate for 30 minutes. Position the racks in the upper third and lower third of the oven and preheat the oven to 350 degrees Fahrenheit. Line 2 baking sheets with parchment paper.Scoop up 1-inch balls of the dough with a spoon or mini scoop and set them 2 inches apart on the prepared pans. Gently press down the balls and put pecans on top (picture No. 7) . Bake the cookies, rotating the pans after 7 to 9 minutes, for 15 minutes, or until the cookies are golden brown. If you like a very soft cookie, bake them for 13 minutes. If you like a crisp cookie, bake them for 17 minutes. Transfer racks and let cool. These cookies look gorgeous! Definitely love that they're a little different with the addition of pecans! These cookies look delicious! 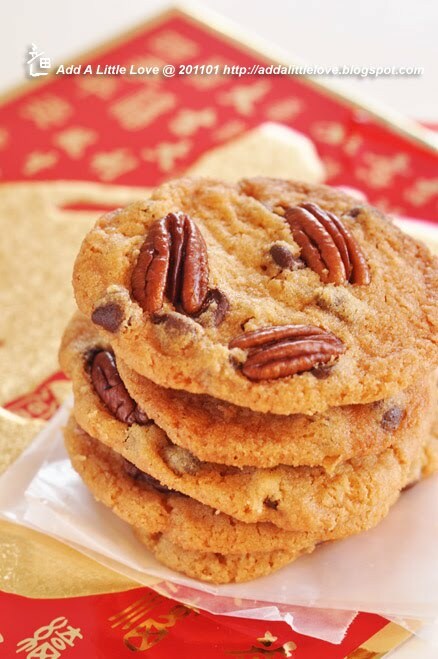 I love pecans, but I've never put them in a cookie. Your pictures are great too! 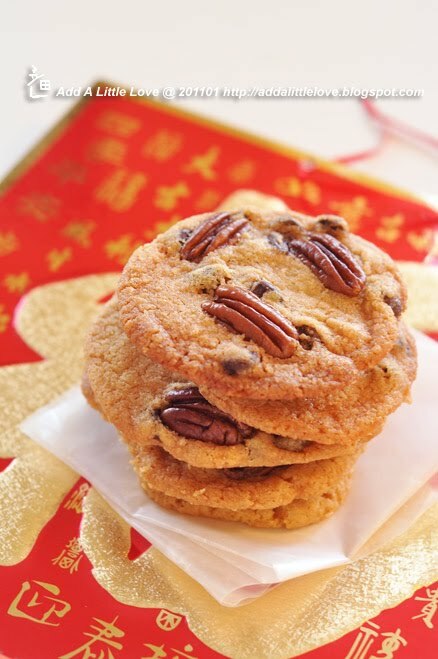 Those cookies look so pretty and I bet the pecans add a great crunch in every bite. I have a linky party on my blog every week called "Sweets for a Saturday" and I'd like to invite you to stop by this weekend and link this up. 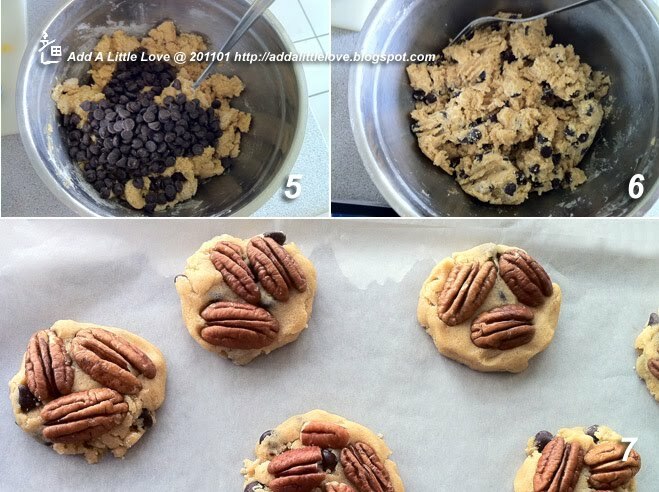 These cookies look amazing, especially with the addition of the pecans on top. Lovely photos too! wow your good :O.. i like it.. I've never thought to take the eggs out! I'll have to give that a try.